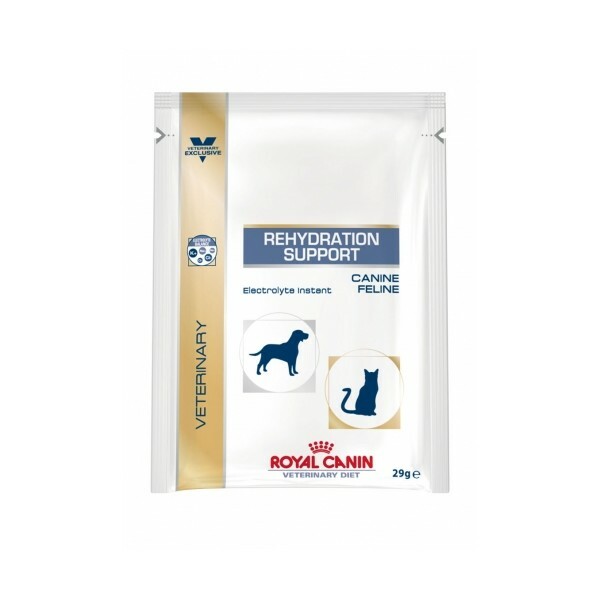 Royal Canin Rehydration Support is a powder sachet for dogs and cats in recovery from cases of dehydration. This includes cases of acute diarrhoea, post-surgery nausea, moderate vomiting and subsequent dehydration, helping to replace vital nutrients that may have been lost from the body. The powder compensates for these losses with a balance of sodium and chloride, working to replenish fluids and electrolytes and nourish from within. The non-invasive powder is also highly digestible and tasteless to suit even the fussiest canine appetites. Electrolyte Balance - Rehydration Support Instant Diet formula has been designed to replace lost fluids and electrolytes in dehydrated dogs and cats. Sodium and chloride contents are approximately equivalent and compensate for losses. Rehydration Support Instant Diet is a solution for oral administration which offers many advantages: - easy administration - low cost - low supervision and maintenance - non-invasive technique. Maltodextrin, potassium chloride, sodium chloride. Nutritional additives: Glycine (5%) - Technological additives: Sodium citrate (3.4%). The following table shows the recommended daily feeding guidelines. Fresh water should be available at all times. There are currently no questions for Royal Canin Canine Veterinary Diets Rehydration Support Dog & Cat - be the first to ask one!